Nutritional yeast is a common ingredient in many vegan recipes. Fairly obscure to most who are unfamiliar with a plant-based diet, nutritional yeast is a staple ingredient for vegans, as it easily lends a slightly nutty, and mildly cheesy, flavor to many dishes. Typically located in the supplement or bulk sections of most natural foods stores, nutritional yeast—as the name implies—is also chock full of nutrients. It is available in two varieties, fortified and unfortified, but fortified is the most commonly sold variety in the United States. Other names for nutritional yeast are nooch, yeshi, Brufax, or savory yeast flakes. Nutritional yeast is an inactive yeast. It's yellow in color and with a nutty cheesy flavor. Nutritional yeast is high in B-complex vitamins (oftentimes fortified with B-12) and on average a 2-tablespoon serving provides about 4 grams of fiber, 8 grams of protein, and is a complete protein—meaning that it provides you with 9 amino acids. Many vegans use fortified nutritional yeast, which provides the daily-recommended amount of B12, which is usually scarce in a vegan diet. Fortified nutritional yeast is also a good source of selenium, potassium, folate, and iron. Nutritional yeast should not be confused with Brewer’s Yeast, which is a different foodstuff entirely. Shelf stable, nutritional yeast keeps well if stored in an airtight container in a cool, dry area. It can be used as a condiment, such as in topping popcorn or pasta, as one may use Parmesan cheese, or as a base for cheesy sauces and dips. 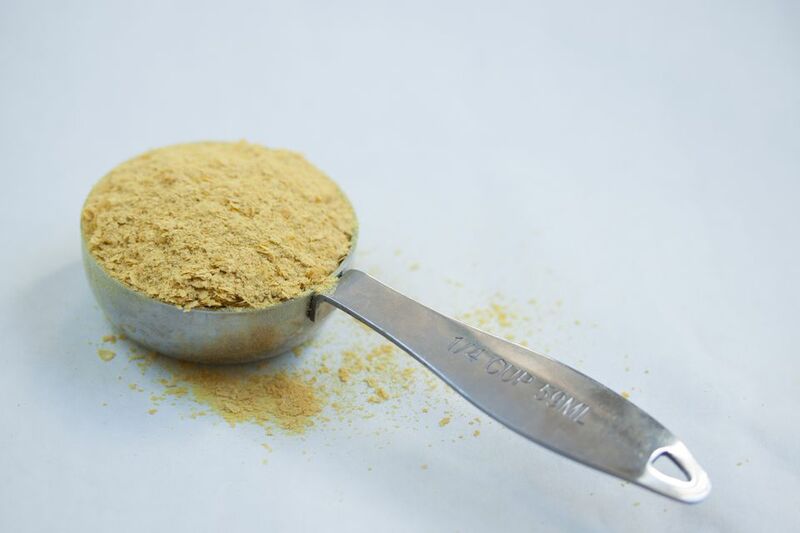 Nutritional yeast—generally different than the strain used for brewing or baking—is grown on a medium, made of glucose that has been derived from sugarcane or beets. The yeast is grown on this medium for a few days and then de-activated (killed) and harvested. Before packaging, the yeast must first be washed and dried. Sold as flakes or powder, either variety can be used in recipes calling for nutritional yeast. Using nutritional yeast in recipes is quite simple as it can easily be added to sauces, dips, and marinades for an extra burst of cheesy flavor. Often it is a favorite ingredient in Vegan Mac and Cheese, tofu scrambles, and vegan queso dips. Many times, turmeric will be also added to a recipe calling for the nutritional yeast to add a slightly orange coloring—which works great for cheesy sauces and spreads. Another great application is to mix with panko breadcrumbs when coating foods, such as tofu or tempeh, or sprinkle a bit on top of bread cubes and toast for easy croutons for salads. A simple way to start using nutritional yeast is to sprinkle it on top of popcorn, add on top of baked potatoes, or sprinkle some on top of a green or grain salad. Including just 2 tablespoons a day can help vegans incorporate important nutrients in their diets, so having a canister of this wonder food around is a good way to ensure you’ll get that extra nutritional boost.